Just a quick post to say I have written a piece about the 126 exhibition at Sutton House on the Notches blog, you can read that here. And also some very exciting news about this Friday’s V&A Late Queer and Now. The film from the ‘126’ exhibition will be playing throughout the night at the bottom of the staircase beneath the National Art Library (where I will be speaking at 19.30). The stairway is one of the main access routes through the museum, which means plenty of people will get to see all of the hard work by the 126 volunteers! I’ve been at Sutton House the last few days filming the exhibition, might seem a bit weird filming a film, but I really like how it looks projected against the white brick wall, so hopefully it will come out well on the film. This is the second year I’ve come to a National Trust event. It’s become a yearly pilgrimage, there’s no place for ‘us’ to come for ‘our’ history. 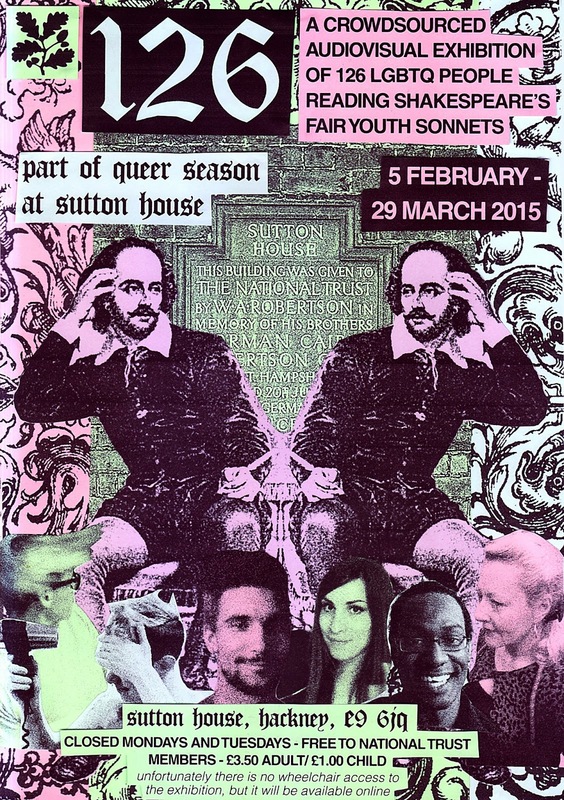 LGBT history month at Sutton House/ the National Trust should continue. Next year, who knows. As a member of the LGBTQ community and a National Trust member I am delighted that this artwork is here at Sutton House. It feels like we are entering into a space where presence is welcomed and voices heard. I think the potential around this art installation is huge. I can see lots of possibilities for schools and young people to connect with Shakespeare, creative media and LGBTQ lives. Thank you. This is exciting, beautiful and welcome. 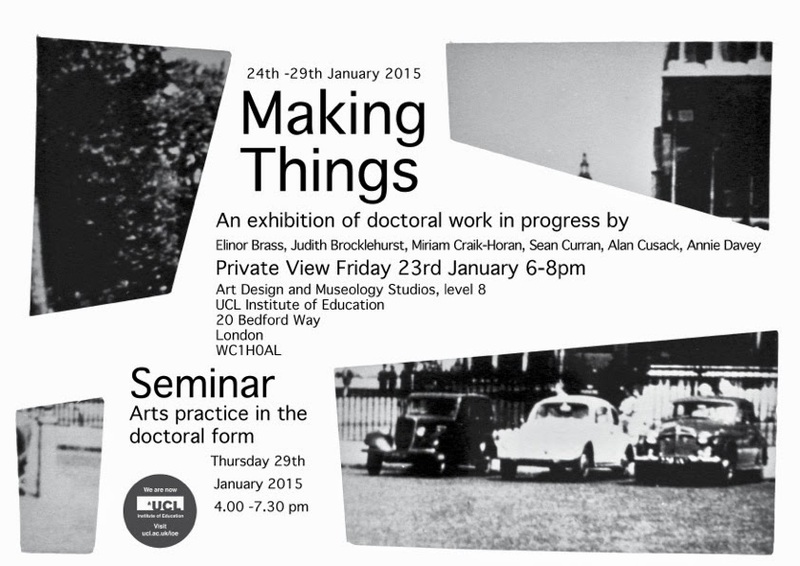 Just a quickie, to share the poster (click on it for a larger version) for an upcoming exhibition that I am part of, based at the Institute of Education, showcasing work-in-progress from doctoral students in the Art, Design and Museology department whose research includes an element of practice. My work is a piece called ‘The village folk had a lot to say about it’, and it is in response to the neglectful interpretation of Mary Lobb at Kelmscott Manor. There will also be a seminar, as you can see from the poster, in which there will be a respondent to each of the student’s work and a discussion about how research and practice intersect. I’m delighted to say that Emily F. Henderson, a PhD candidate at the IOE researching feminism, gender and queer theory in connection with international Higher Education, has kindly agreed to respond to my work. You can check out her new book here. The exhibition opens the week before 126 does- eeeshk, it will be an exciting few weeks!